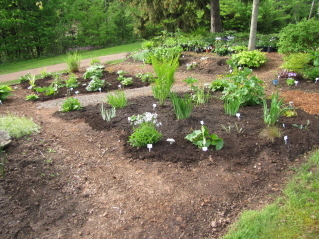 Doesn't the beds look great with compost on them. I was lax last year in getting them top dressed. This year I was determined that that they would all be done. Usually I get my compost from our local bailfill (municipal composting program)﻿. I usually have good luck with it but I make a point of not putting it in my veggie garden. 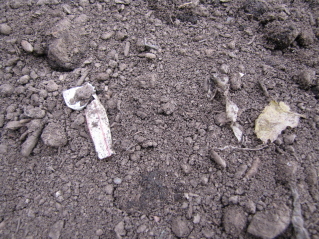 A lot of people are not careful with what they put in the compost bin, there is always a lot of plastic (bags) and even though it is screened, there is still plastic and other small non composting items in it. And even though it is a in-vessel system (it is heated to the proper temperatures), I prefer to know exactly what is in it for my veggies. Ideally the best time to get it (municipal compost) is late summer. That is because they sell it by weight (tonne) and in the spring it is usually alot heavier but the last few years they have run out of it. But I really needed some so Andrew took the trailer to get a load. They were really good about it and did deduct some off the price because of all the wet weather we have been having. But it was really chunky and difficult to spread. I have noticed that it is breaking down if I run the rake gently over it, it will smooth out. You do get a bit of plastic showing up but over all not too bad. Many people used to complain about the smell years ago. I guess it used to be very bad. It still does have a bit more odor than other companies. That is due to the fact that it is not turned as much as it should be. Frequent turning would solve the problem as well as the chunkiness. 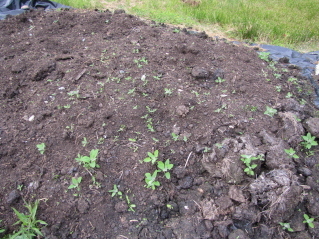 Fundy Compost in Pleasant Valley (also North River Rd, Bible Hill) was my third try. They do take the local Bio Solids from the Waste Water Plant in Truro and mix it other material to produce compost. They also take other county's municipal green cart waste and make compost out of it. They do keep both streams separate. We purchased the non bio solid compost which is equivalent to our municipal compost. Fundy Compost windrows their compost to bring it to temperature to eliminate pathogens and weeds.﻿ Their compost was not as chunky, much finer and any 'balls' were easily broken up. I did find quite a few rocks ranging from golf to baseball size which probably came from the gravel pad it was piled on. The only thing I didn't like is that there was a lot more garbage in the load, I picked out a lot of small pieces of plastic (shopping and garbage bags) . 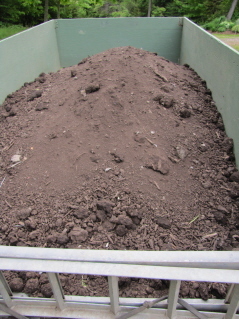 The compost had a good compost smell due to the fact that it was probably turned more often. Even though it had more garbage, I got a second load. I don't like to use bark around my perennials, I just find it too chunky (I must like that word). However a lot of people use composted bark.﻿ This is a good alternative for larger perennials, if you have a hosta bed for example. I don't think I would like it for more delicate perennials and certainly not an alpine garden. This comes from Nova Tree Seed, across from the old Truro Hospital. 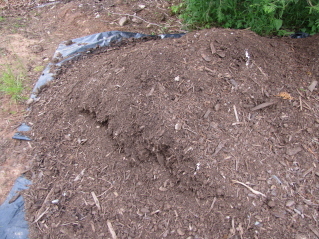 It is a nice product in that it is well composted and quite fine. I use it in my soil mix for my potted perennials. I like shredded hemlock for my shrub beds and paths around the perennial garden (like the colour). I use pea gravel in the alpine (cactus) bed. 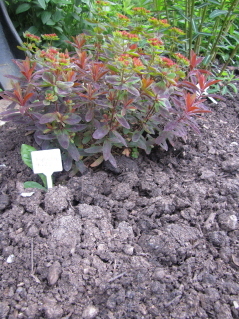 I don't like coloured mulches. That is a personal opinion.